Volunteers needed. If you can help please contact us for more information. We like to get involved in our local community. We enjoy raising funds and awareness for good causes and individuals in our area via our walking football society and Foot-Golf. Our £1 a week Lifesavers Lottery tote is another great way to raise funds, as all profits go to our good causes. Walking football is a great way for anyone over 50 to keep themselves physically and mentally fit, and help raise funds and awareness for Alzheimer's and Dementia. We are constantly developing our society and always looking for new players, teams and refs. Get in the hole.... Foot-Golf is a perfect way to keep fit and have fun. 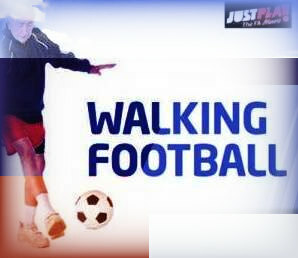 It's a low impact, gentle sport, and as long as you can walk and kick, this game could be just for you. Our Lifesavers lottery tote gives everyone a chance to be a Lifesaver. It is £1 per week and all profits go to our chosen good causes. The lottery is run by volunteers and you cannot win much, the first prize is just £100. We are regularly out and about knocking on doors in the Black Country & Wyre Forest areas looking for new players. and many more, as well as Lifesavers lottery collectors and volunteers. Gary was on top of the world... The Lifesavers' Ben Nevis Challenge, for The British Heart Foundation, was hard work, but a huge success. If you would like to get involved in future events, or be a volunteer for us please call 01384 341673 and ask for Dave. Our charity football match against Birmingham City All Stars was lots of fun and we proudly raised £1,700 on the day for Macmillan Cancer Relief. If you do not have the time to help us with our sponsored activities and events, but would like to be a local Lifesaver you are welcome to join our weekly lottery tote. Just £1 per week helps to support our good causes. See the lottery page for details or call Dave on 01384 341673. Robert giving his blood... "It's very nearly an armfull"
Why not do something amazing today??... give blood and be a genuine LIFE-SAVER. Blood stocks are low. Most people can give blood, but sadly only 4% of people in the UK donate. Each blood donation can help up to 3 people. Please help. If you're aged 17 to 77 years, generally in good health and weigh at least 7st 12lbs (50kg) then you can become a blood donor today. For more information please visit the link below or call 0300 123 23 23 at any time.